Hydroboost braking systems have been around for a long time. They have been used on many GM truck models and have been used on race cars for years. How does a hydroboost system work? Before I answer that question let me explain how the conventional power brake systems work. Most power brake systems employ a vacuum booster to provide pedal assistance when braking. That large drum attached to your brake cylinder in your engine compartment uses vacuum produced by your engine to help push the plunger in the brake cylinder when you apply pressure on the pedal. A hydroboost system uses hydraulic pressure to assist in pushing the plunger in the brake cylinder when you step on the pedal. The hydroboost unit simply replaces the vacuum booster and fits between the firewall and the brake master cylinder. 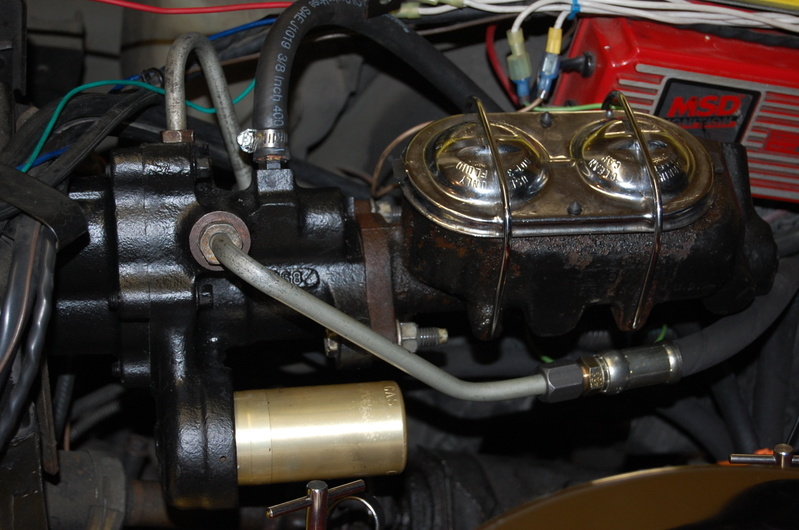 Most hydroboost systems piggy-back on the power steering system for the hydraulic pressure. What are the advantages to the hydroboost system? The most noticeable difference is in the braking response and reduced pedal effort. A typical vacuum system depends on your engine for the vacuum source. Once engines are modified, they often do not produce sufficient vacuum to provide the assist necessary and therefore, stopping your car requires more pedal effort on the part of the driver. The hydroboost system is much smaller and frees up space in the engine compartment for things like deeper valve pan covers, etc. 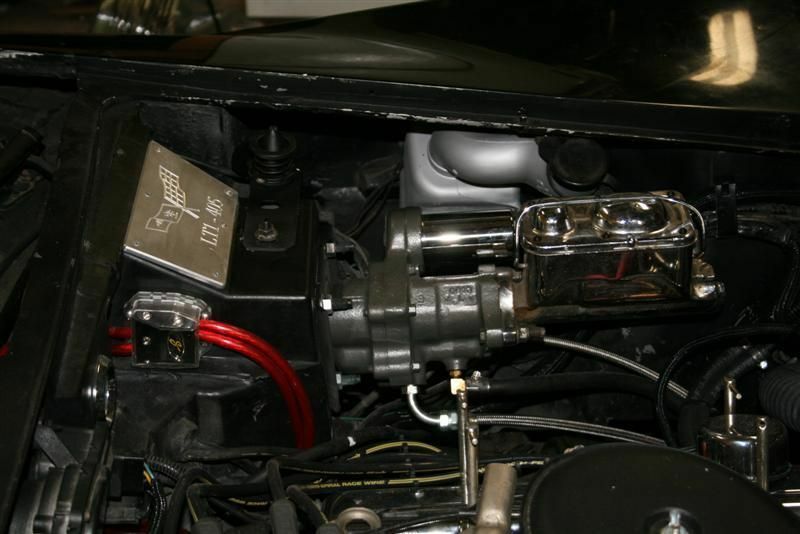 Hydroboost kits are available from several sources for the C3 Corvette. Most of these kits use a Bendix unit and come with all the hoses and fittings for the install. These kits require a 1977 or later master cylinder. Manual brake C3 cars can be converted to hydroboost but require some holes to be drilled in the firewall. The actual install is quite straight forward. The first thing you will want to do is to remove the old vacuum booster. This is probably the most time consuming and frustrating step. The booster has four studs going through the firewall and pedal bracket. The nuts on these studs must come off. I suggest that you remove the driver seat unless you have a chiropractor on call. You will need a deep socket, some extensions, a universal and lots of patience. You also need to remove the clip and clevis pin that connects the brake booster to the brake pedal. On the firewall side, remove the two nuts securing the master cylinder to the booster and pull the cylinder forward. It is not necessary to disconnect the hydraulic brake lines as there is sufficient length in the lines in order to pull the cylinder forward far enough to clear the booster for removal. Disconnect the vacuum line from the booster and pull the booster free from the firewall. Before you start the install you should disconnect the high pressure line from the power steering pump and let the fluid drain. The high pressure line is the one which has the fitting screwed into the pump. You can also disconnect this line from the steering control valve or in the case where you have a Steeroids unit, disconnect the line from the rack. You can remove this hose as you no longer need it. 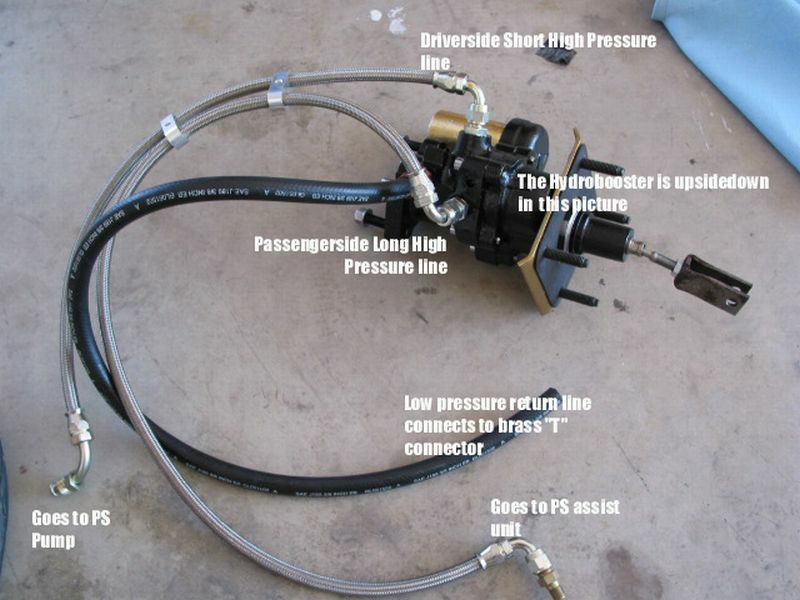 (Note: If you do have a Steeroids unit you will need a high pressure hose with Aeroquip 18mm fittings on both ends as the hydroboost and rack use the same connector.) While the power steering fluid is draining you can now return to the install. If your new hydroboost unit does not have a clevis on the plunger rod, you need to remove the one from the old booster and install it on the new unit. Install at the same position on the rod as it was on the old booster. You can now install the hoses on the hydroboost. There will be three of them. Since they all have different fittings you cannot mix them up. The hoses will all be on the bottom when the unit is installed. You are now ready to push the unit through the firewall. Before you do that, make sure the clevis is lined up with the brake pedal. Unless you have someone helping you, this make take a couple of attempts. Once the unit is pushed through, you can now put the four nuts back on and tighten the unit in place. (Note: I highly recommend that you reverse the studs so that they come out through the firewall into the unit with nuts on the firewall side. This makes it easier for removal should that ever be the case.) You can now put the clevis pin through the pedal and secure the clip. Put the seat back in and take a break. Push the master cylinder back over the studs of the hydroboost unit and secure with the two nuts. You are now finished with the top part of the install. Route the hoses down to the power steering pump and control valve (or rack). Make sure to route the hoses away from the exhaust and any suspension components. There is a brass tee fitting in your kit that needs to be installed in the return line going from the pump to the control valve (or rack). Cut your existing return line about five inches away from the pump fitting, slide clamps over each side of the cut ends and install the tee in the line. Slide a clamp over the new return line from the hydroboost and shove the hose on the tee. Tighten the three clamps. Install the high pressure lines on both the pump and the control valve (or rack). You are now ready to add power steering fluid to the pump. I would suggest that you disconnect your ignition temporarily so that you can turn your engine over without it starting. That way you can keep adding fluid until the system is pretty well filled. Connect your ignition and start the engine. Check for any leaks. You might want to cut your wheels back and forth a few times to help bleed the air out of the system. Check the fluid level in the pump and top up if necessary. If you notice lots of air bubbles in the pump, allow the car to sit for 30 minutes. You are now ready to test the brakes. Make sure you have a hard pedal before you start up. Once you start the engine, press the pedal a few times to make sure you indeed have brakes. You may hear a hissing sign coming from the hydroboost. This is normal until all of the air gets out of the system. You are now ready for a test drive. I think you will be pleasantly surprised. It may take up to 500 miles of driving before the system is working at the optimum. 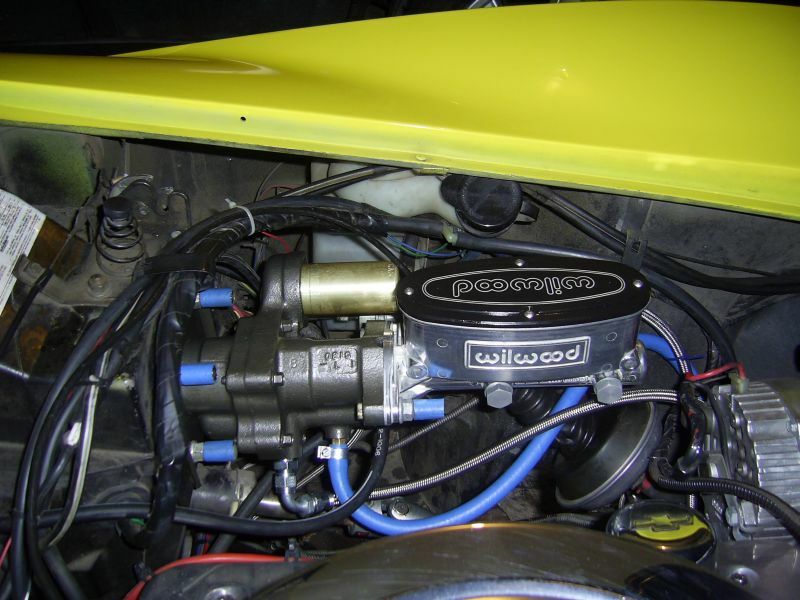 If you are looking for a correct Wilwood master cylinder (1.12" bore) for this setup, contact Donna and tell her that you need a 260-8556P Wilwood master. Donna is extremely personable and she will get your cylinder to you quickly. If you are interested in more information about hydroboost for your C3 or are interested in obtaining a kit, contact Hydratech Braking Systems. They are extremely knowledgeable about this specific application. Here is a picture of my setup and it works superb.